This year I’ve had the incredible privilege of working with the Johnston (IA), Emmetsburg (IA), and Prior Lake-Savage (MN) school districts in an Innovation Academy format. I thought that I’d share what that work has looked like in Johnston as we’ve progressed through the school months. At the core of the Johnston Innovation Academy has been five full days – each about a month apart – of in-depth work with over forty district, building, and teacher leaders. Day 1 was all about the big picture. As I said to participants on that first day, if we’re going to really prepare students and graduates for the world outside of schools, it’s imperative that we truly understand what that world looks like and how it works. The focus of Day 1 was on exposure to the societal contexts surrounding school, including new literacies, economic and workforce trends, and how technology is transforming everyday life. Day 2 focused on the overarching concept of connectedness. 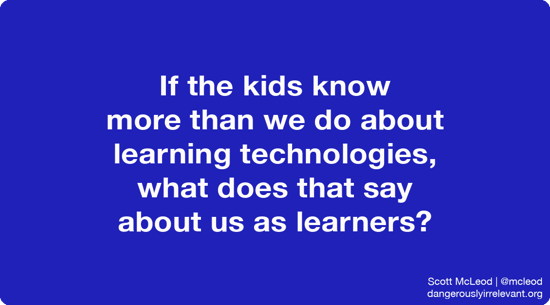 We analyzed and strengthened our own personal and professional networks (both digital and analog), saw how connectedness is transforming both group interaction and individual relationships, and examined a number of connected learning initiatives for students and teachers. On Day 3 we dove into rich, robust learning that focuses on deeper thinking and student agency. We looked at ‘gold standard’ project-based learning in depth and also evaluated a variety of school curricular and time models that facilitate greater learning ownership and active, hands-on work by students. On Day 4 we pulled in the trudacot discussion protocol to see what rich technology infusion looks like within the context of deeper learning and also studied numerous schools’ blended learning models. The end of Day 4 and all of Day 5 were about action planning: How do we take what we’ve learned and discussed and apply it forward? One key to the success of the Academy has been the regular attendance of every participant. In many districts, administrators and teachers rarely sit side-by-side for multiple days of focused, cohesive learning. Having 40+ educators go through the same five days of in-depth learning allows for shared understandings, capacity-building, and commitments. Another critical component has been Johnston’s intentional alignment of its Academy with other district transformation initiatives. For example, Johnston has an Executive Director of Teaching, Learning, and Innovation who is able to help the superintendent move the Academy work forward in between meetups and also align it with that of other groups. Johnston also has a unifying vision and mission (expressed in the form of a compass), has sent teachers and administrators to visit several innovative schools to bring new ideas and practices back home, and has held multiple community roundtables to gather input from parents, business leaders, and other stakeholders (which, unsurprisingly, have confirmed the directions in which Johnston is heading). 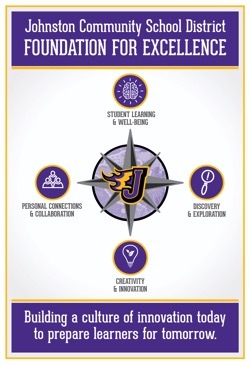 All of these work together to feed Johnston’s intentionality, focus, and alignment. As you might expect, we’ve had an incredible year together and I’m looking forward to seeing where they take things over the next couple of years. What is your intentional, focused, structured, long term approach to initiate greater innovation?